Kickback Jack’s is the perfect place to cheer on your favorite sports teams & enjoy a great time with family & friends! Whether you want to treat your loved ones to lunch or grab a drink with your co-workers after a long day at the office, Kickback Jack’s is the place to be! Our sports bar in Southern Pines provides a welcoming atmosphere so you can sit back, relax, & enjoy a nice cold drink in a casual, friendly environment. Come check out our restaurant in Southern Pines, and we assure you it’ll be one of your favorite spots for entertainment, food, and fun! Want to learn about our specials, upcoming events, televised games and more? Contact us for more information! 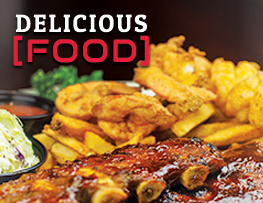 Here at Kickback Jack’s, we pride ourselves on serving fresh, made-from-scratch appetizers, entrees & desserts. It gets better - not only are our ingredients fresh, but our menu has something for everyone. Whether you’re craving chicken wings, juicy burgers, hand-crafted pizzas, delicious sandwiches, or crisp salads, we have it all at Kickback Jack’s! What’s more, we also offer a wide variety of draft beers, local brews, and hand-crafted cocktails to compliment your meal perfectly. Join us at our Southern Pines sports bar to experience endless entertainment, fun with friends and family, and of course our delicious food. Check out our current specials! These offers are limited time only, so come visit us today to be sure you don't miss out! What's better than watching your favorite sports team at your favorite sports bar in Southern Pines? Enjoying a refreshing drink while you're watching the game! 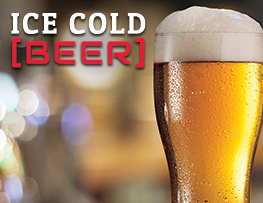 We have daily drink specials and a large beer list that's sure to suit everyone's style. Don’t miss another game during dinner by taking advantage of our comprehensive NFL and college football television packages! With over 50 televisions on site at each location, you don’t have to worry about missing a single play. You can watch your favorite basketball, baseball, and football teams on our large-screen, high-definition tvs, which are all conveniently located throughout the entire restaurant. No matter where you’re sitting- entertainment will follow! You’ll never have to miss a single second of action again. Enjoy spending time outside? Enjoy our outdoor patio--complete with a full bar, great HD experience on our big screen TVs, and of course excellent food and service! What’s not to love? Come relax and enjoy a cold beer the ultimate sports bar in Southern Pines from the time we open all the way through our fantastic late night! In addition to Southern Pines, Kickback Jack’s provides great food, drinks and fun from sports bar locations in Durham, Fayetteville, Greensboro, Greenville, Asheboro, Raleigh, Hickory, Mooresville, High Point, and Wilmington, NC, as well as Danville, Midlothian, and Richmond, VA.